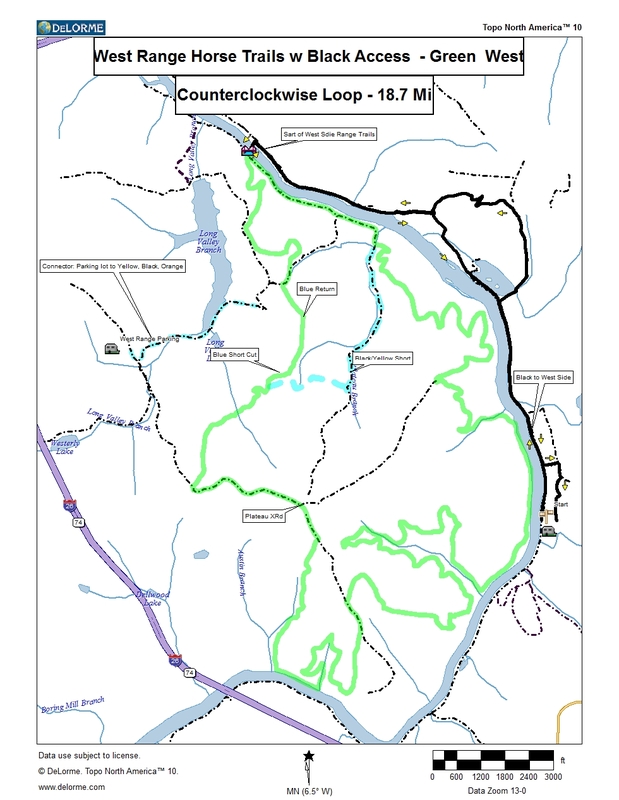 This site will provide information on the trails (particularly maps) used by the Biltmore Equestrian Center for its various user groups. 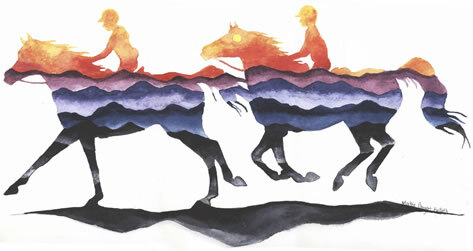 Particular upcoming events will have 'top billing', with everyday 'day rider' trails towards the bottom. This is an experimental arrangement. Comments on maps should be addressed to Stagg Newman. Comments on the web site should be addressed to Cheryl Newman. 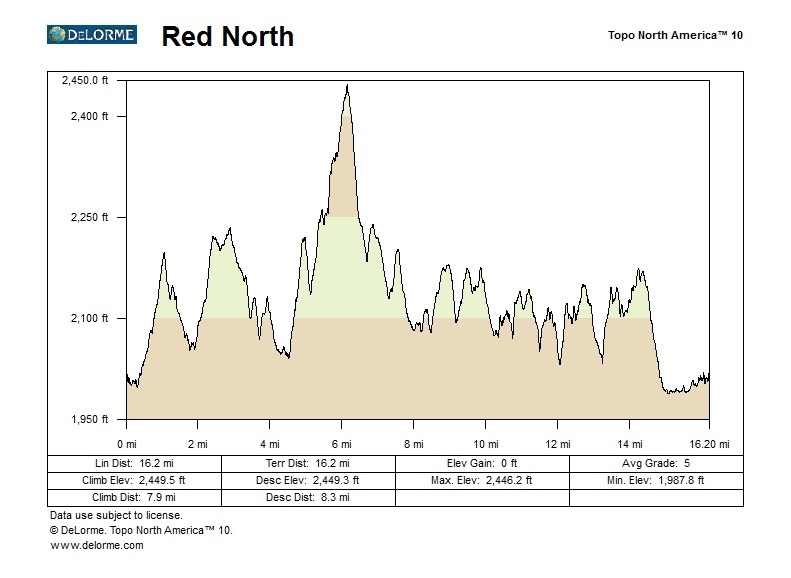 West Range Rides -- 2019 -- April 27, July 13, and Oct 12. Bridge gates will open at 9am and riders must be off the West Range by 2pm. For maps see the West Range. For full logistics, contact BEC 828 225 1454. 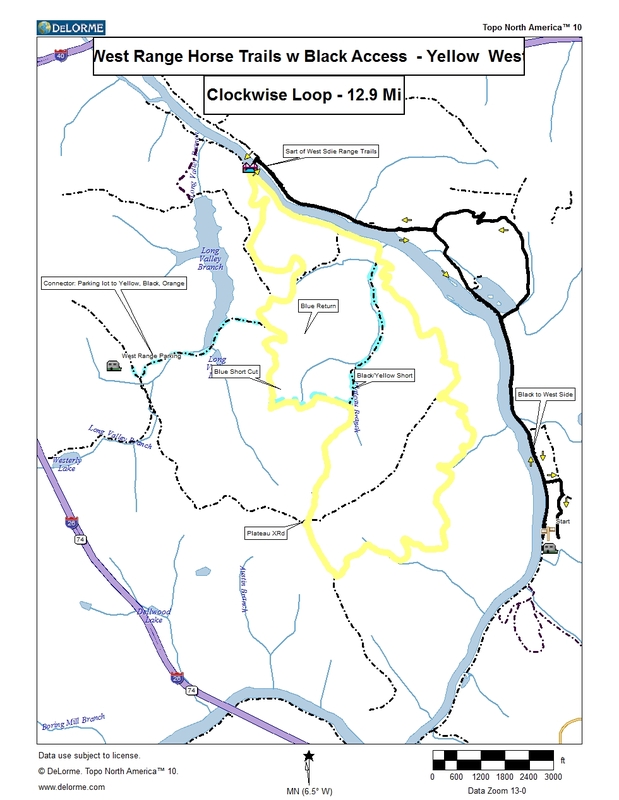 In general, $15 / rider, payable 'at the bridge' that crosses the French Broad River. 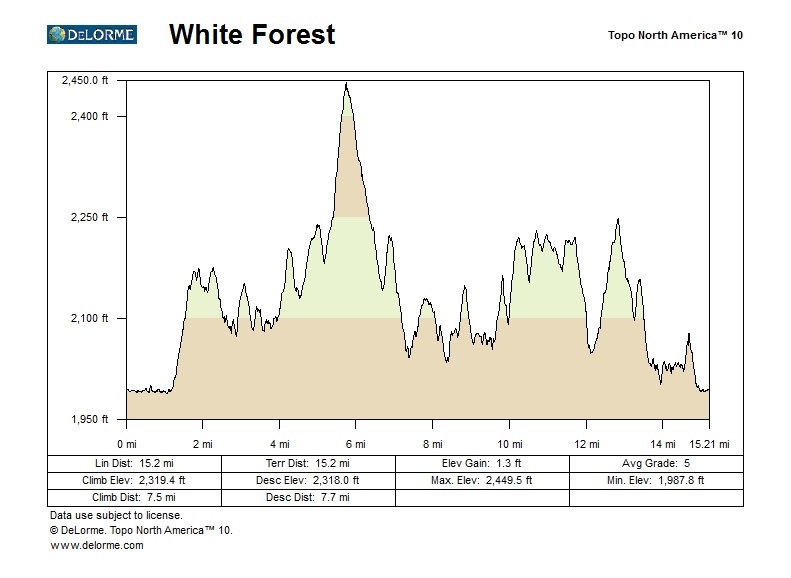 Day Trails --trail summary maps and information are available below. 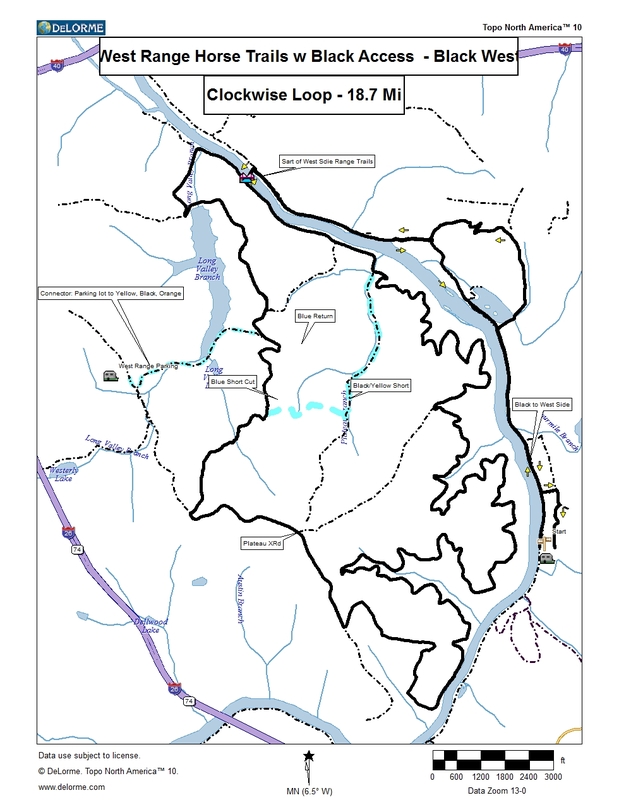 The French Broad River separates the East Side Trails (main part of the Estate) from the West Range Trails. East Side Trails are accessed directly from the day trailer parking area, and are generally open as the Estate is open to passholders and other guests of BEC. The West Range Trails have access limited to occasions such as West Range Rides, some hunter paces, and some competitions. 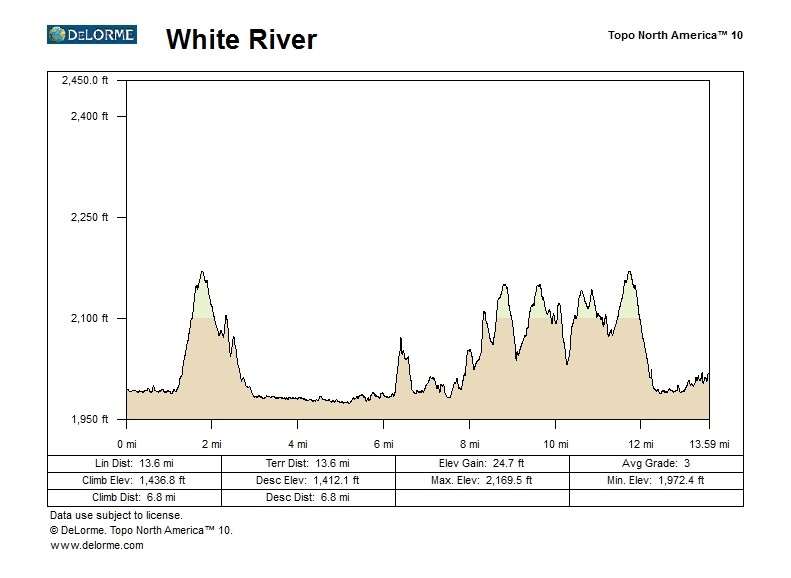 West Range Trails are generally accessed by the intra-Estate bridge across the French Broad River. East Side trail information includes an overview legend; West Range trail information has its own overview legend (not yet available). 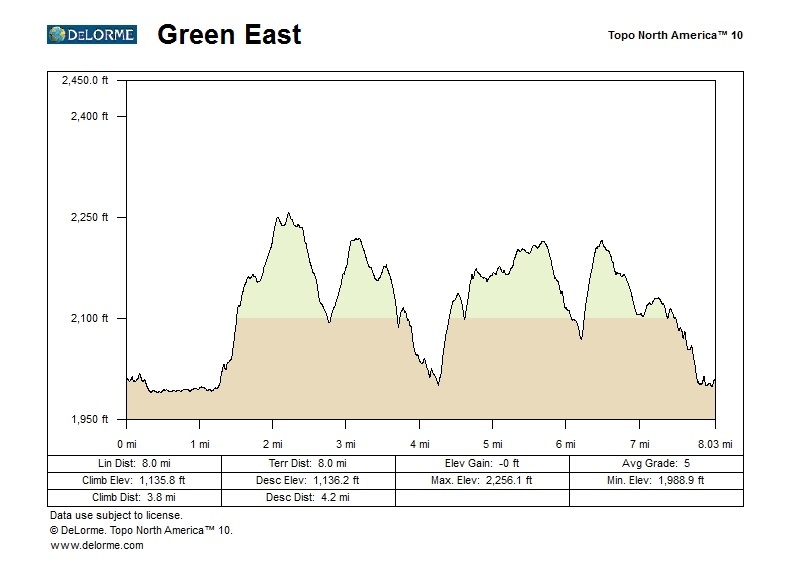 To help in map clarity, East Side trails are broken into North and South sections. 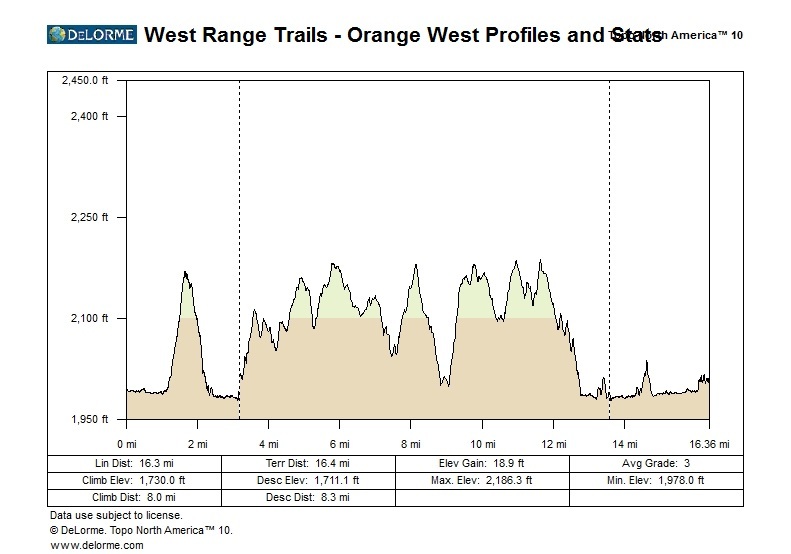 Meanwhile, West Range section trails are all together. 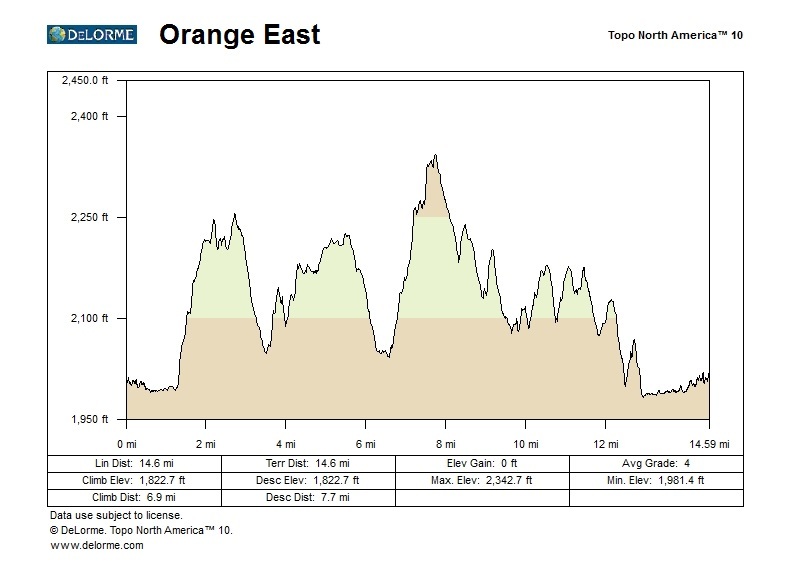 For each section, you will find a combined overview map; then individual colored trail maps with individual elevation profiles / statistics and individual sheets with legends and summary trail descriptions. Note: on printing maps, making them come out as single page, formatted correctly: right click (or control-click) on the map link, download it, and print the downloaded file. East Side Trails. All east side trails are on the main part of the Estate and are generally available for riding. The maps all follow the patterns identified in this legend. The legend sheet also contains a thumbnail summary of all East Side trails. ==> East Trails North Section. 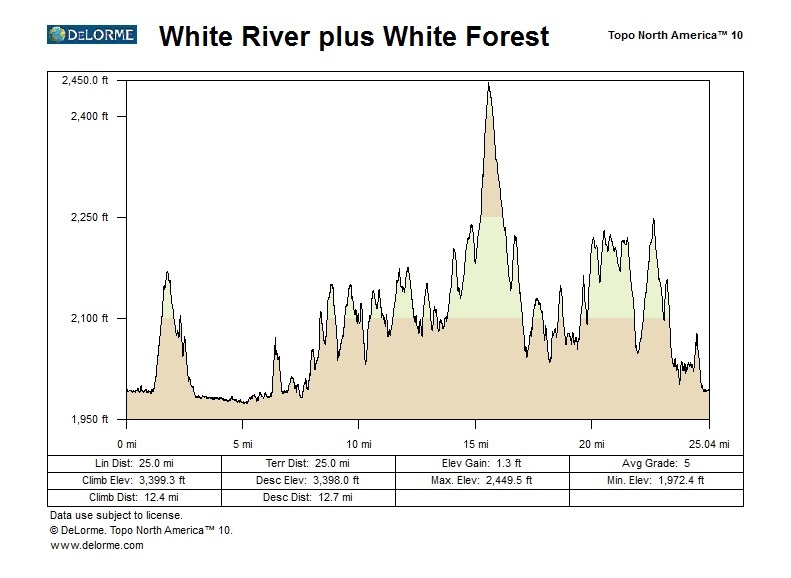 North Section trails include White River, White Forest, White North (White River + White Forest), Red North, and Orange East. ==> East Trails South Section. 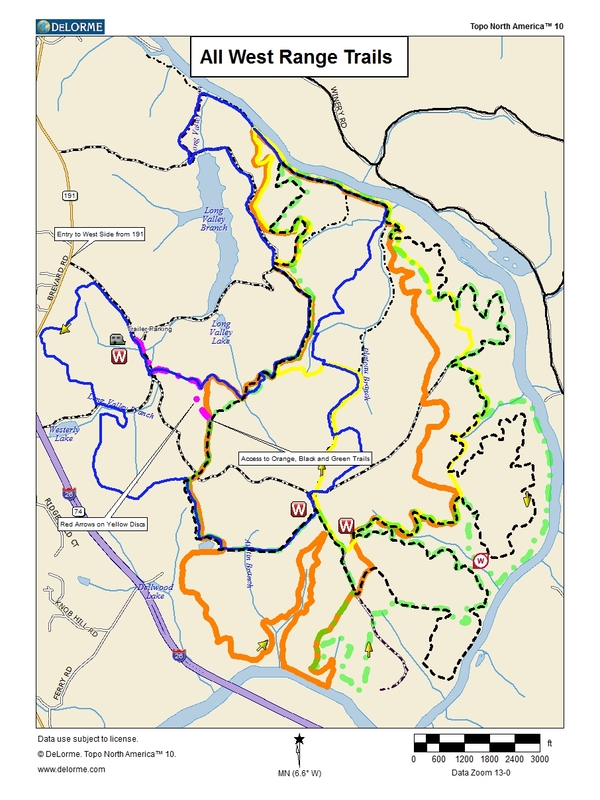 South Section trails include Red South, Blue, Yellow and Green. 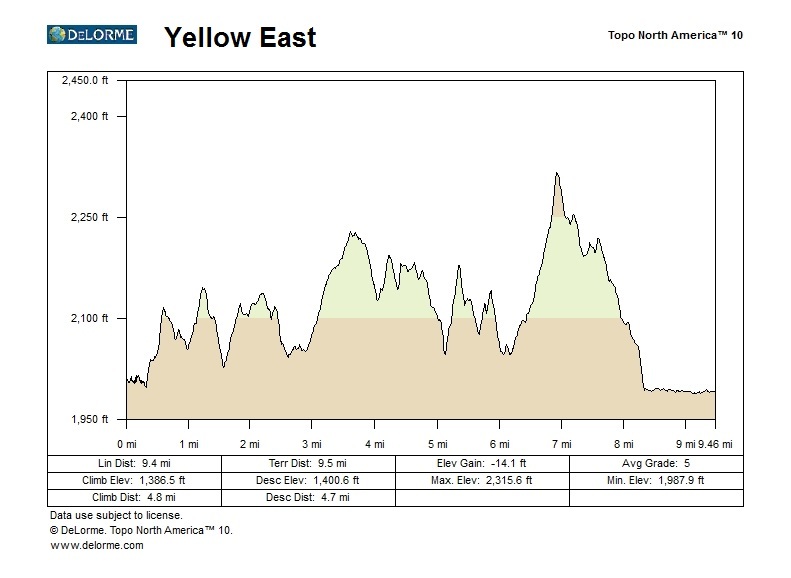 Yellow East, 10.1 miles, map, elevation profile / statistics, and trail description and legend all information current May 2016. Map not current. West Range Trails. 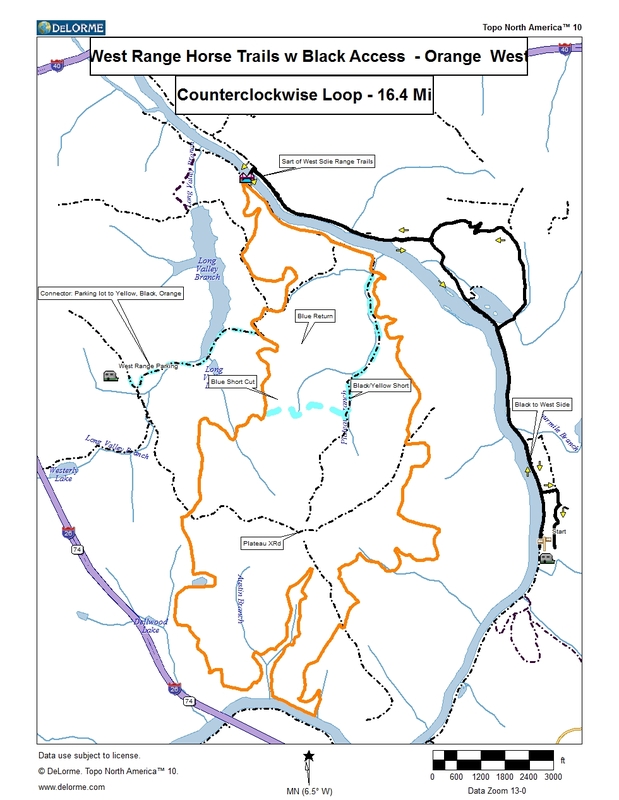 All West Range trails are on the west side of the French Broad River and are available on occasions such as West Range rides and various competitions. 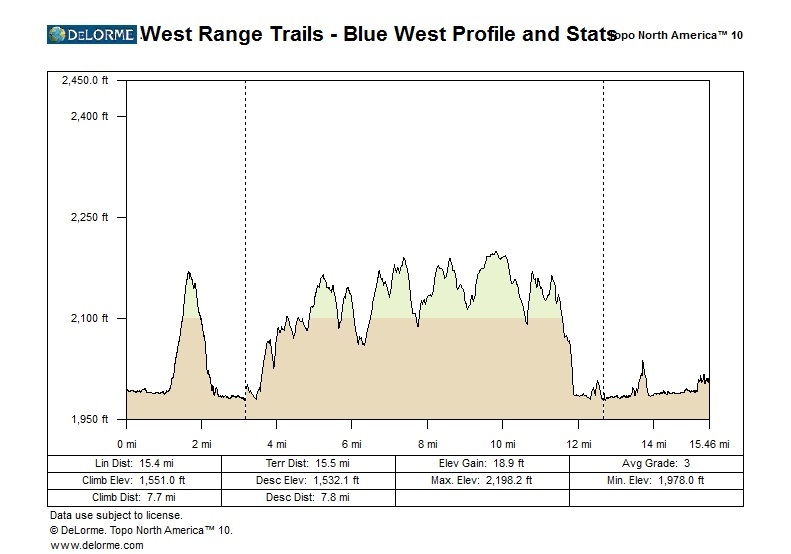 All West Range trails are accessed by a Black Bridge Access trail from the day camper parking area to the bridge and back. 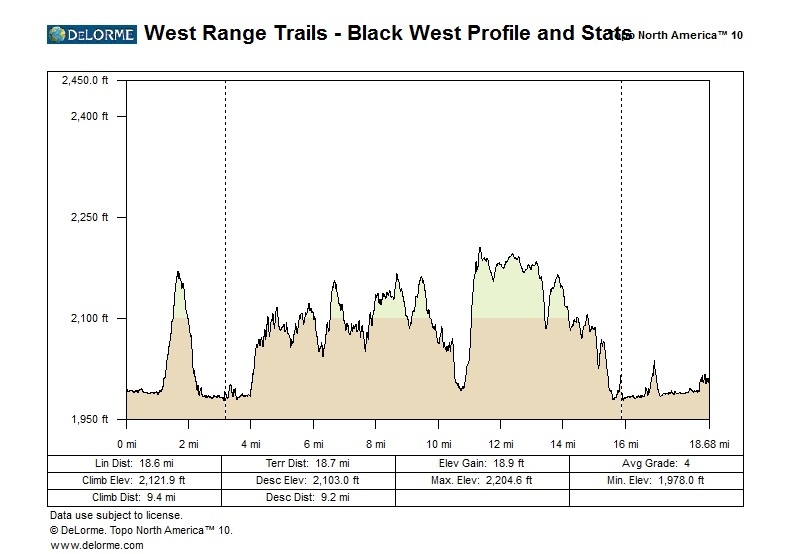 That Black access trail is shown on each map and is included in the elevation profile. 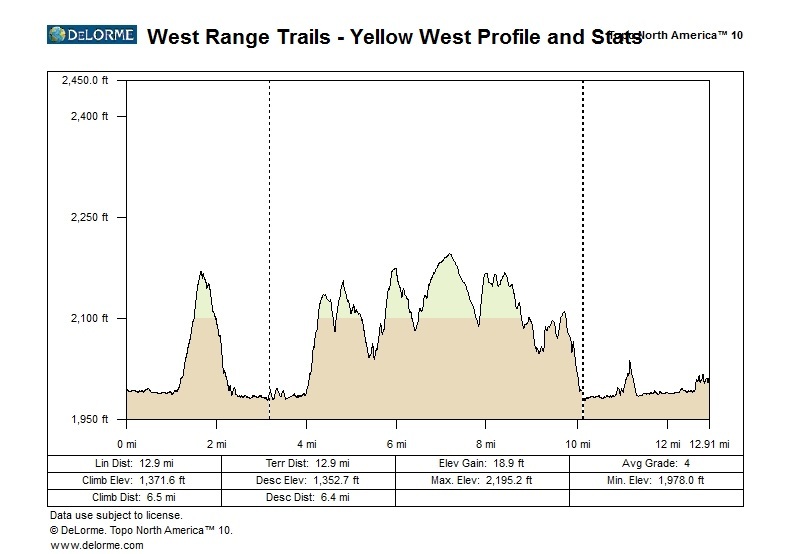 West Range trails include Black West, Yellow West, Blue West, Green West, and Orange West. Occasionally, access to the West Range is from a trailer parking lot off Alta Vista Road, off NC 191 (Brevard Rd). Mileages differ minimally. The maps all follow the patterns identified in this legend. 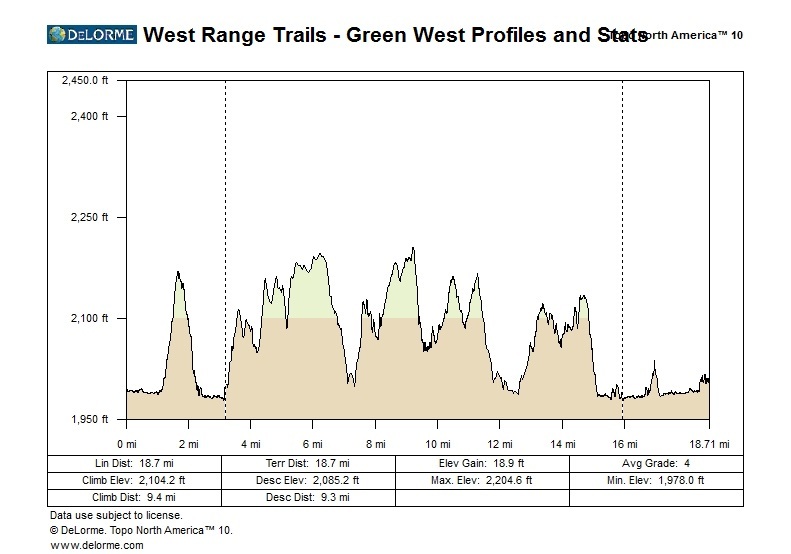 The legend sheet also contains a thumbnail summary of all West Range trails.